Can you believe it, I actually won a competition. Not only that, I won it for a photograph of one of my flowers (doing the happy dance here). I bought all my bulbs from Hadeco, South Africa’s prime bulb producer. Then I found out that they have a weekly photo competition they run on their Facebook page and a few weeks ago, when my bulbs started flowering I started entering, and have done so faithfully each week. This week one of the first entries they received (you can see the entries on their page) was a magnificent green Arum Lily (Zantadeshia) and I thought it would surely win and I decided not to enter this week as I didn’t stand a chance. But what do you know … excited about my first white Asiatic Lily flowering, I took a photo very late Thursday afternoon as the sun had gone down and decided to enter it after after all. And yesterday afternoon I got a huge surprise when I received an e-mail telling me my gorgeous Lily has won me a hamper from Hadeco! 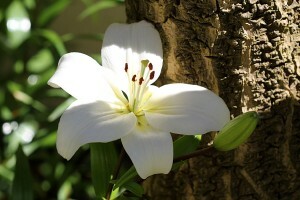 I’m sure it is the lovely Lily that won me the prize as it hasn’t got anything to do with my photographic skills. But in case you are interested, you can click on the left photo below to see the original, uncropped version that I submitted. The one on the right I took today when the sun was shining, just to see how it would look with the sun shining on the flower. On the winning photo I love how pure the new Lily looks against the magnificent bark of the tree. On the other photo, It shows me that sunlight and time of day makes a huge difference to the overall look of the photograph (i.e. the flower looks more beautiful without the harsh light of the sun on it). I’m very excited to have won something and thrilled that the prize is a hamper of Hadeco bulbs! I’ll post on the blog when I receive the hamper. Christine, Just dropping by to let you know that your captions have been selected and have been posted today. Thank you for your contributions. Christine – you are very humble about that photograph! It is definitely “the money shot” – no question. Congratulations – your win is well deserved! The flower is gorgeous. Hi Shyrlene – Thank you so much! Oh, how thrilling! Not just the winning – but getting even more bulbs! I hope your prize arrives soon. 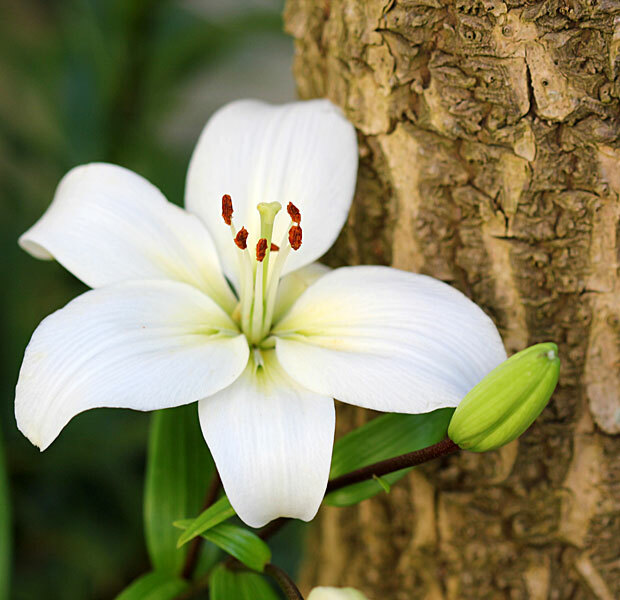 Beautiful lily picture. 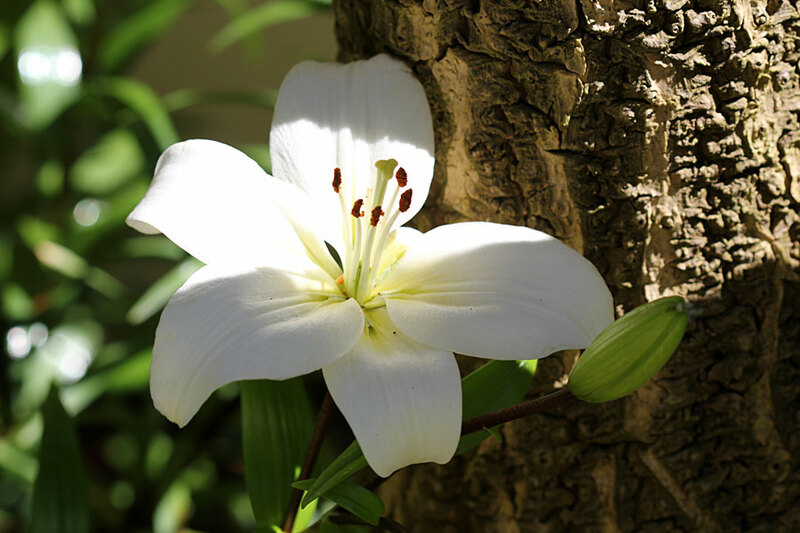 The lily is perfect, and the bark gives such wonderful contrasting interest. Congrats! Hi Holley – Thank you. I think the bark of the tree actually “made” the photo. Hey!! Wow!!! What a deserving win!! The Lily (awesome!!) is so beautifully perfect and the photographer in you is starting to see that it isn’t all the learning and the years of experience. It is timing! Perfect light, perfect subject perferct timing!! Well done my friend!! You must be proud!! Yeay! Wow congratulations! All winnings are wonderful. And that lily is so beautiful also on its own. I can’t see that color in nurseries here so when i saw it in one of my friends, i asked 2 bulbs, however it turned out to have virus. It is alive but not nice because of the virus. At lest it is in a container in the office and will not affect other plants. 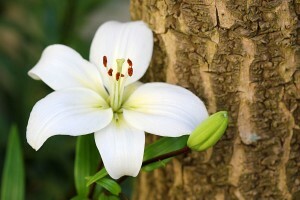 Thanks Andrea – I hope your lily survives the virus. Wow. Well done you! And to think now you get more! I’ve been trying to photograph a white iris for the past few days. Think I will pop out towards the end of the day and see how I go! Thanks Alison! It was a lucky shot – but I’ve learnt to wait till late afternoon or early morning to do flower photographs – they look much better! Congrats on your win!!!! Very deserving as it is a lovely shot. pollen on the stamens, details on the petals – congratulations! wonder what’s in the hamper? Congratulations!!! Awesome Picture! Lighting can make such a difference, though I liked both photos! Thanks so much! I’m slowly learning about the effects of light on photographs. Congratulations, Christine. It’s both a beautiful flower and a beautiful photograph — a winner either way! Thank you Jean! I’m loving the Lilies at the moment. A Salmon pink coloured one opened today. Too beautiful for words. Congratulations on your win. The photo is very beautiful. Thank you 4Bees. BTW, your Avatar is the cutest! As you’ve learned, strong sunlight is your enemy when photographing the garden. Congratulations! That is such an honor and your photograph is beautiful! Congratulations, Christine. I can feel your excitement. Actually I am so thrilled, feeling as if I am the one winning! The photo is beautiful! It looks a whole lot more stunning without the shadow.